You can always tell when Decker Campbell has been shooting from a helicopter because she'll have a giant grin from ear to ear. "The wind blowing in my face, God's beauty all around, anticipating the shot, working in sync with the helicopter pilot -- It's pure glory!" she declares. Partners and operators of Charlotte, North Carolina's Streamwerx, Decker Campbell and Ann Williams turnkey video productions from script to post. Williams, a writer/producer, also takes still photos while DP Campbell shoots with the Sony XDCAM EX1 camera and captures stock footage for the company's growing library. 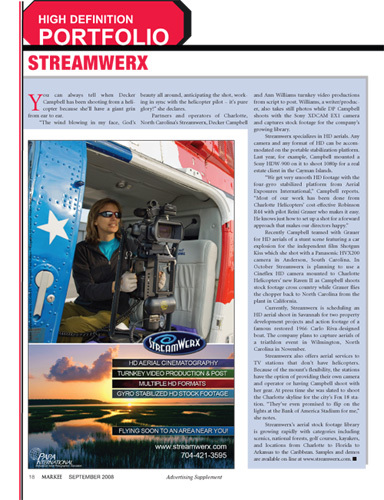 Streamwerx specializes in HD aerials. Any camera and any format of HD can be accommodated on the portable stabilization platform. Last year, for example, Campbell mounted a Sony HDW-900 on it to shoot 1080p for a real estate client in the Cayman Islands. "We get very smooth HD footage with the four-gyro stabilized platform from Aerial Exposures International," Campbell reports. "Most of our work has been done from Charlotte Helicopters' cost-effective Robinson R44 with pilot Reini Grauer who makes it easy. He knows just how to set up a shot for a forward approach that makes our directors happy." Recently Campbell teamed with Grauer for HD aerials in Anderson, SC for a stunt scene featuring a car explosion for the independent film "Shotgun Kiss." Currently, Streamwerx is scheduling an HD aerial shoot in Savannah for two property development projects and action footage of a famous restored 1966 Carlo Riva-designed boat. The company plans to capture aerials of a triathlon event in Wilmington, North Carolina in November. 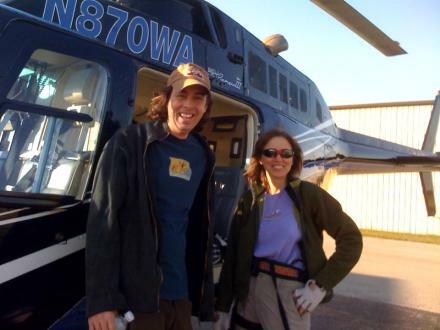 Streamwerx also offers aerial services to TV stations that don't have helicopters. Because of the mount's flexibility, the stations have the option of providing their own camera and operator or having Campbell shoot with her gear. At press time she was slated to shoot the Charlotte skyline for the city's Fox 18 station. "They've even promised to flip on the lights at the Bank of America Stadium for me," she notes. Streamwerx's aerial stock footage library is growing rapidly with categories including scenics, national forests, golf courses, kayakers, and locations from Charlotte to Florida to Arkansas to the Caribbean. Samples and demos are available online at www.streamwerx.com. Unique among HD stock libraries is Charlotte, North Carolina-based Streamwerx (www.streamwerx.com), a rights-managed library specializing in HD aerial footage. Decker Campbell, a DP who's partnered with writer/producer Ann Williams in the business, deploys Charlotte Helicopters for her shoots and utilizes an Aerial Exposures gyro-stabilized video platform that can accommodate almost any camera. "Over time we have collected a lot of 1080i footage for our library; currently we are shooting true HD in 1080p," says Campbell. "Since some TV stations prefer 720p, we have stock footage in that resolution, as well. We try to fly as much as possible since it's so enjoyable to see the world from this perspective." Streamwerx's aerial themes include coastal resort and waterfront lifestyles, with clips shot in Florida, Texas, Tennessee and the Ozarks of Arkansas; autumn mountain foliage in the high country of North Carolina and Virginia; the Charlotte skyline from dusk to dark, including Panther Stadium in lights and rush hour traffic patterns; low flights over the mountains, lakes and national forests of North Carolina, Georgia, Virginia and West Virginia (some with POV shots showing the pilot and flight experience); races at Hickory Motor Speedway and practice at Lowe's Motor Speedway; Carolina Panther stadium and the University of West Virginia stadium. your direction we will contact you," she says. "As long as the date for your project is flexible, everybody wins!" 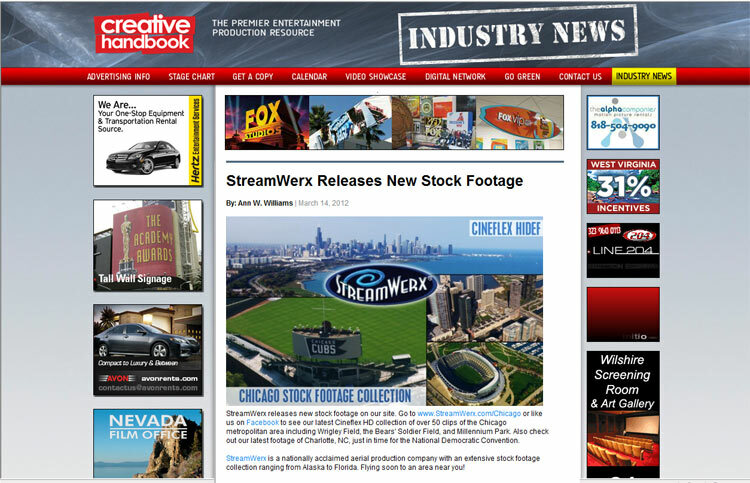 Streamwerx expands its offerings on a regular basis. "We are planning on shooting in Phoenix and across the Texas panhandle in late October," she reports. "Union University in Tennessee is expecting us to film their campus on our way back to Charlotte as part of that trip. We may have a New Hampshire trip shaping up, too." One of the funniest things Campbell has experienced lately won't be showing up in the library, however. When she was shooting HD aerials for the independent film, "Shotgun Kiss," the helicopter landed in a pasture for a meeting with the director. "Walking away from the field, I turned back to see two curious horses nuzzling the helicopter," she recalls. "One actually had his head inside! Unfortunately, we have no stock footage of that...The horses had my camera!" Director of photography, Sam Pietsch and aerial camera woman, Decker Campbell on-location for a shoot in Louisville, KY.
Tampa,FL -- February 5-7, 2009 -- The Professional Aerial Photographers Association International recently held their annual conference in Tampa, Florida. They awarded the "Best Aerial Video" to a joint collaboration between Streamwerx and Boyle Consulting. The promotional video was created for a Virginia mountain community, Fox Creek Falls and was judged on the use of aerial footage, steadiness, beauty and presentation. Accepting the award were Chuck Boyle, Managing Principal of Fox Creek Falls, and Decker Campbell, President of Streamwerx. Ms. Campbell's company filmed all of the aerials and provided post production. Herb Kossover (Kossover and Company), Thomas Miller (Blue Sky Aerials), Steve Panariello (Digital Island Video). Herb Kossover is an Emmy award winning producer/director and is recognized nationally for his work as Director of Photography during the 1996 Atlanta Summer Olympic Games. Thomas Miller most recently lensed "Aerial America" for the Smithsonian HD Channel. And Steve Panariello's aerial production credits include ABC, CBS, NBC, CNN, ESPN, Fox, HBO and the Discovery Channel. "We chose to award the Fox Creek Falls piece as "Best Aerial Video" because the beauty and flow of the production created emotion. Mr. Kossover added,"It made me want to live at Fox Creek Falls!" The award winning video focused on the natural beauty and outdoor activities found in the Southwest Virginia Highlands and Mount Rogers National Recreation Area. Showcasing the mountain community of Fox Creek Falls, the video was narrated by the legendary voice of WBT Radio and WBTV, Doug Mayes, and was masterfully filmed by Decker Campbell with the help of helicopter pilot, Reini Grauer of Charlotte Helicopters. Special thanks go to the Reborn Ramblers for their original music. PAPA International's recognition of this exceptional achievement in aerial video establishes it even further as a very effective marketing tool.